You know that book that you had when you were learning how to do a clinical examination? Even books have a teaching style. Mine was like an old school maths professor. It taught me that there is only one correct answer and often only one correct way to get to the answer. And stop doodling Snelson! If I had owned a paediatric examination text I imagine it would have been more like a literature teacher. I'm imagining Robin Williams in Dead Poet's Society. It would teach me that you're never going to approach the same problem the same way twice, and you will probably even find that the answer changes. Who would like a chocolate? 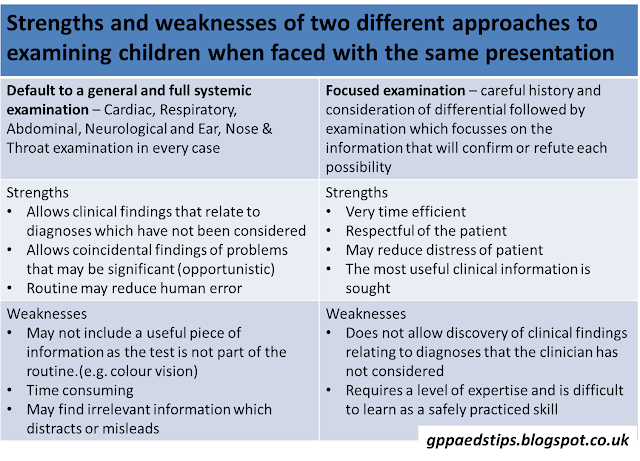 In paediatrics there is no such thing as a routine examination. This is for several reasons. Having a routine only works if the same approach works regardless of age or cooperation of the child. It doesn't. I am sometimes asked by medical students whether they should be palpating the trachea or percussing the chest of a child. The obtuse answer is that you should do these things when they are useful and practical. Often they are not. If they are, do it. In any case, examination is normally tailored to the situation. If a child presents with a finger injury, I presume that the GMC will let me off if I don't check to see if the child has developed a cardiac complication. Paediatrics is a speciality that quickly teaches you not to think in terms of routine. Children may have their own opinions about what is about to happen and you often find yourself asking whether something is worth the battle. General Practitioners have made an art form of the focused examination. 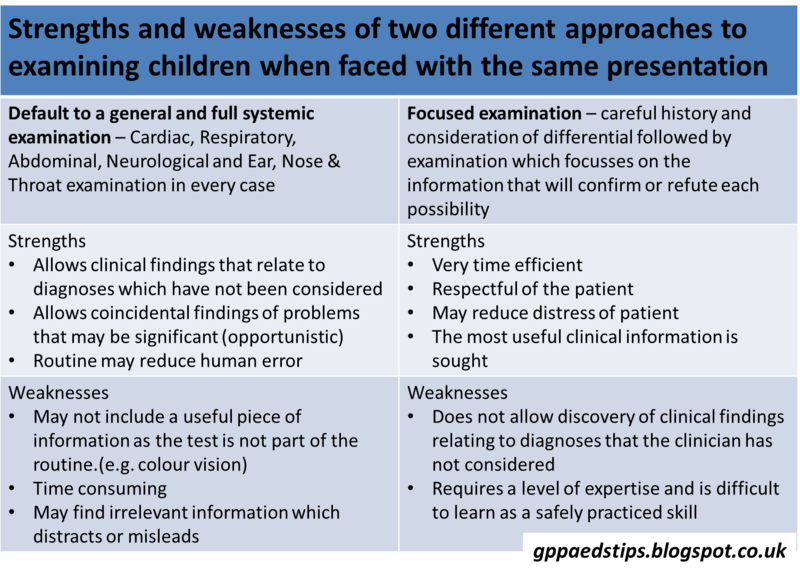 The way that this works is that by the time an examination takes place, the clinician has heard the history and thought about the possible causes of the symptoms in that patient, given their age and past medical history. What is examined is made up of a selection of what that clinician needs to support or refute each differential diagnosis. This way of working is very different to the way that hospital medics tend to approach the same problem. The default in secondary care tends to be a full systemic examination (if that is a thing) in all cases, injury not withstanding. Each approach has strengths and weaknesses. The best approach is probably a combination of the two. Having a minimum general examination is of value as is the ability to tailor your examination to the patient and the presentation. There are some elements of examination which are just not part of most peoples routines. Whatever is left off the "do it every time" list, you need to know and remember when to do it as part of the focused element of an examination. 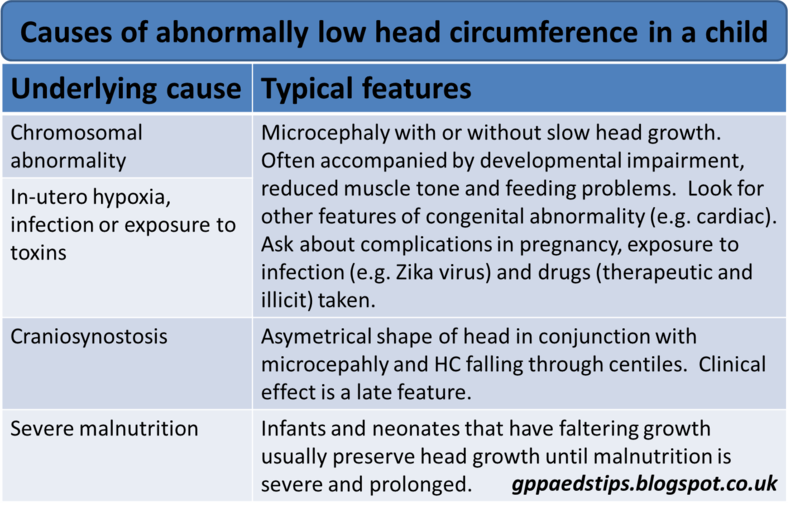 Let's look at head circumference as an example of something that is routine for some clinicians in secondary care paediatrics but not for most clinicians in primary care or emergency medicine. 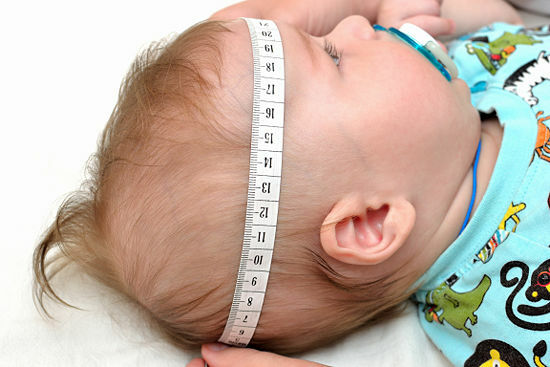 As long as it is done properly, with the correct equipment, measuring head circumference is easy and a more reliable growth parameter than length in babies. Like any growth parameter, the recorded value is of little use without context. Head circumference is usually measured either as part of routine monitoring of growth or as part of the assessment of an infant or toddle who has presented with a problem. In either case, the interpretation of the measurement needs to be in context of a clinical assessment. The most important elements of this are feeding history, concerns about growth, developmental assessment and neurological examination. What constitutes abnormal head circumference? 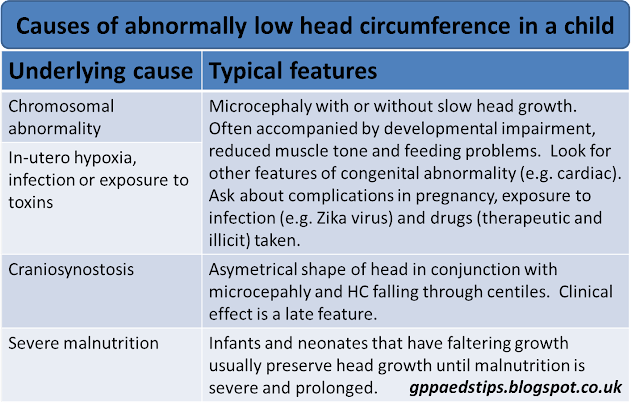 What causes abnormal head circumference? In many cases, HC outside of the 98th or 2nd centile (or where it is disproportionate) is constitutional. That is to say that it is genetic but without underlying abnormality. Just as some people are taller or shorter, some people have bigger or smaller heads. In these cases, there is no other abnormality (including development) and the measurement usually closely follows a centile line. When do I need to check a head circumference? Why vomiting infants? It's rare as anything can be but brain tumours can present in babies as vomiting. Of course, because it is such rare pathology, it is rarely considered early. Although it is not going to identify a problem very often, checking HC in these babies is harmless and could help to make a diagnosis earlier. What about the asymmetrical heads? Positional plagiocephaly is a benign moulding of the skull which is now very commonly seen in infants. There was a sharp rise in the incidence of plagiocephaly after the "Back to Sleep" campaign advised to only allow babies to sleep on their backs until old enough to roll over. This change had a huge impact on the number of cot deaths but it meant that more babies had flattening of the back of their heads, or an asymmetry caused by a tendency to look to one side. There has been much debate about plagiocephaly treatment but the majority of experts without conflict of interest agree that this is a benign condition (no neurological effects) which tends to improve, if not always completely resolve, as the infant becomes a toddler. Benign though it is, positional plagiocephaly is common enough to create a risk that craniosynostosis (plagiocephaly's evil twin) might be missed. 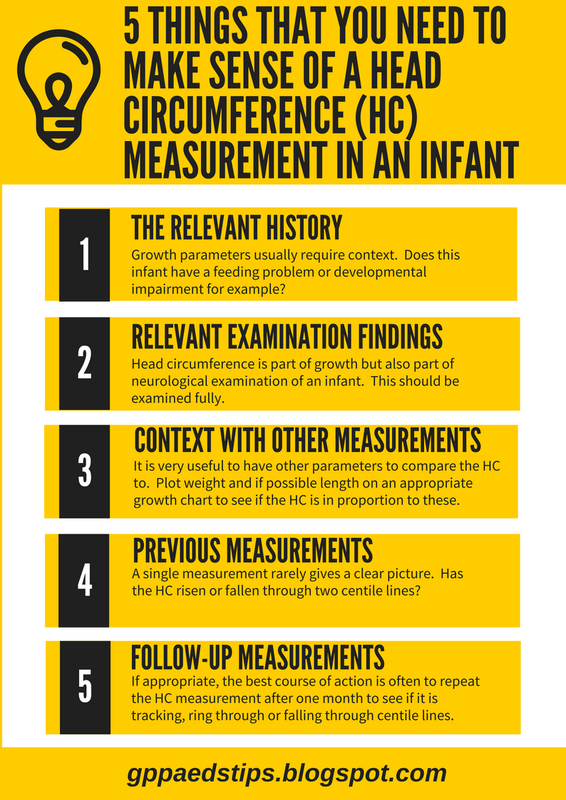 Avoid that pitfall by measuring and monitoring the head circumference. Also check for a ridged suture and a misshaped or small fontanelle. Change the position of interesting things around the cot. Alternatively, place the baby's head at the opposite end of the cot on alternate days. Consider using a sling to carry the baby instead of being flat in a pram. But what about the spleen? 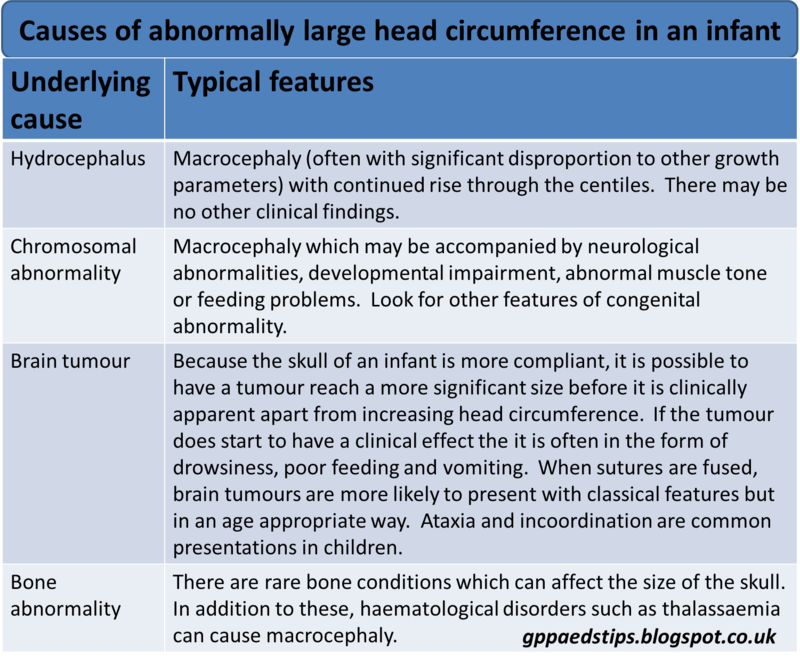 Somehow it just doesn't feature in the assessment of positional deformational plagiocephaly as long as craniosynostosis has been ruled out. What does the book say? Well, that is a question worth discussing with your literature teacher. Disclaimer: I've just realised- I was better at maths than literature. Ignore everything I've said. Clearly I'm in the wrong speciality. keep it up good post!